Time to hand in the keys to the post box tomorrow morning and head down to 80 mile beach. A lot of national parks to visit between here and Black Rock in Melbourne. We'll miss the Federal budget, the remaining U.S. primaries and a few AFL games. It's a hard life! It always cheers me up! Just like Broome itself Labor View from Broome has many visitors from overseas. 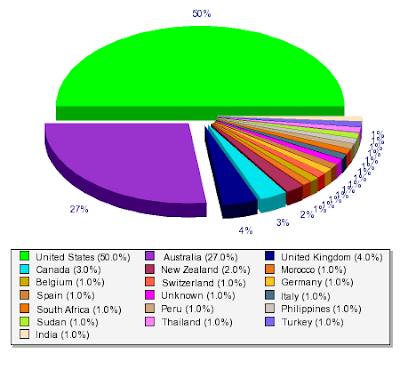 I was surprised by the latest results for Country Share on Sitemeter. It covers the last 100 visits. Certainly posts on Voices without Votes have increased the political traffic but a closer examination of referring sites shows the power of Google searches including an increasing number of image searches. Kwoff and Digg also feature regularly with less from Reddit. ClustrMaps shows an even greater diversity of countries visiting the site. On Monday we are leaving Broome and returning to my country, Melbourne, to live. Might post occasionally during the next five weeks but will spend most of the time out of mobile much less internet range. Diesel is $1.80 a litre here. Wonder what it's fetching on the Gunbarrel Highway. Expect a new name in late June. WA Sunday Times: Not ducking but goosed! When we moved to WA in January last year I was staggered to learn of both the powers of the CCC Corruption and Crime Commission) and their exercise of those powers: phone taps, bugging, recording of private conversations and surveillance involving people not directly accused of anything. A sort of Star fishing Chamber. Despite or perhaps because of my long time involvement with the ALP, I would not be surprised if the assertions of dirt on the government's hands were true. However, at this stage it is pure speculation. I suggest that someone ask the CCC to investigate whether the Ministers have abused their powers. As a Broome ALP sub-branch member I enjoyed Shelley Archer MLC's hospitality at Party functions in her home before her forced resignation and regularly visited her electorate office. I have often joked that my political jokes and anecdotes were being recorded and would be taken out of context, or worse in context. The public seem happy to watch the squirming of politicians and the legion of urgers and suits (and hats in Brian Burke's case) who inhabit the decision-making lobbies. It is a costly exercise in both financial and civil liberties terms. Lots of unethical behaviour, some bordering on the illegal, has been exposed. I'm not aware of any successful criminal charges. The media have thrived on the revelations emanating from the CCC's activities but aren't prepared to cop the collateral damage that comes with this heavy handed approach to keeping the bastards honest. 'What's sauce for the goose is sauce for the gander'. It was a combination of JFK's inauguration and George W. Bush's appeal in 2000 to bi-partisanship. It is ironic that Bush presented himself as the Washington outsider against Al Gore. Jimmy Carter and Bill Clinton used similar slogans during their campaigns. Until he secured the Republican nomination John McCain had always positioned himself as the insider's outsider, in but not of Washington. Barack's "new politics" echoes Kevin Rudd's "new leadership' of the 2007 Australian election. It can be irresistible against opponents who are perceived as offering more of the same, even Hillary Cinton. McCain may well be swamped by Obama's surge. Not game changer or game over. Certainly not really Clinton's claimed tie breaker. It's the end game now and Hillary has very few moves left. But it appears she'll battle on. Barack Obama's failure to win Indiana and bury her for good leaves a major question mark over his seemingly inevitable presidential campaign. 40 years after the assassinations of Martin Luther King Junior and Robert Kennedy the gun debate in the U.S. has hit rock bottom. After Barack Obama's comments about small town America clinging to guns, Clinton's campaign has sent a mailout to Indiana voters questioning his stance on guns: Where Does Barack Obama really stand on guns? The image of the gun pictured on the face of the mailing is reversed, making it a non-existent left-handed model of the Mauser 66 rifle. To make matters worse, a prominent gun dealer said, it’s an expensive German gun with customized features that make it clearly European. Don't you just love it when they get straight to the heart of the matter. The Hillary mailer, in selectively quoting from this, omitted all of Obama's references to people's economic circumstances, leaving the misleading impression that all Obama did was "accuse" rural and small-town Americans of being "bitter" people who "cling to guns." It seems that everything is being taken out of context in this election season. Ask John McCain about about his 100 year Iraq war and oil statements. Ask the Reverend Wright. Obama recognizes that we must forge a broad coalition if we are to address the great conservation challenges we face. America’s hunters and anglers are a key constituency that must take an active role and have a powerful voice in this coalition. I'm not even game to look at the Democrats' policies on the death penalty. But then again Hillary and Barack are/were supposed to be liberals. It's time to reprise The Great Presidential Race. If you haven't watched it, the metaphor has a continuing life. Hillary's predicted demise is a bit like the US recession, the numbers don't quite stack up yet. World Press Freedom Day on 3 May highlights the importance of freedom of the press, and reminds governments to uphold their citizens’ right to freedom of expression enshrined under Article 19 of the Universal Declaration of Human Rights. It’s also a chance for us to reflect on the damage caused to individuals when freedom of the press is denied. Who said that freedom of the press was owning one? You often get that feeling in Western Australia where there is a virtual monopoly of print media. Hopefully where there is "free" internet, that is becoming less of the case. Little comfort for the Chinese or the Tibetans at the moment.